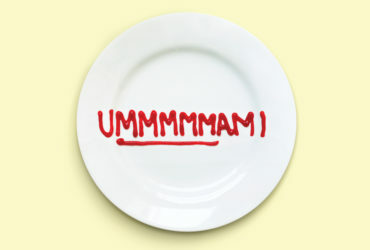 Home / Food Chemistry • Food Technology • Health & Nutrition • Industry • Sensory & Consumer Science • Uncategorized / I scream! You Scream! Now we all scream for Healthy Ice Cream! Think about the last time you went to a grocery store. You weaved your way through the aisles to pick up the staples: veggies, fruit, eggs, milk, bread and as you start to mindlessly make your way out of the store, suddenly you find yourself in front of the ice cream display. As your eyes scan the freezer shelves, perusing through the many colorful labels they stop suddenly and read something that is not like the others. 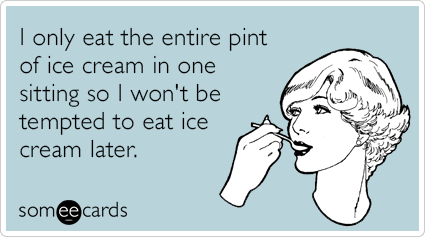 “280 calories per pint.” Per pint?!?! They must be joking! Multiply that by four and you have a pint of Ben and Jerry’s ice cream!1 You open the door and grab the container in disbelief. 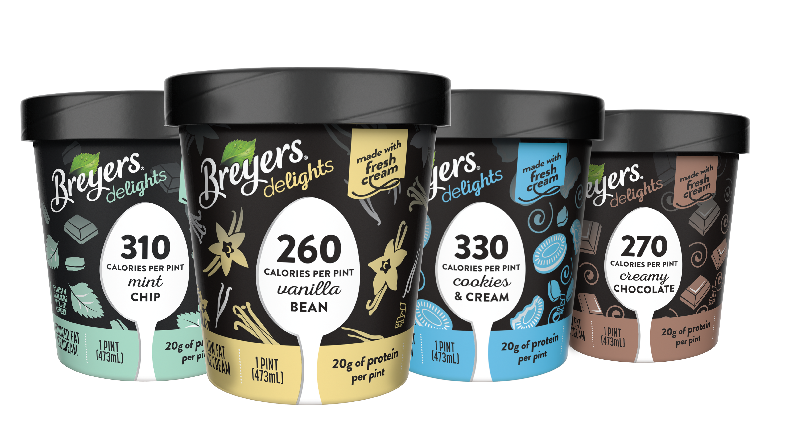 When you take a step back you suddenly realize there are actually multiple brands touting the low-calorie health halo of their ice cream: Breyer’s, Enlightened, Arctic Zero and Simple Truth just to name a few. Initially, it seems you may have finally opened the door to a gold mine, but then the skeptical part of your brain kicks in and you wonder to yourself is there really such thing as a healthy ice cream? Unfortunately, this blog post will not hold the end-all be-all answer to that question, but rather serve as an avenue to educate yourself on the latest health craze of low calorie ice creams. In this blog post expect to learn the history of the trend, how food scientists achieved this miracle ice cream with half the calories but all of the flavor, explore the true psychological draw of these products, and finally the discuss future of ice cream as we know it. This trend definitely has people talking. Halo Top’s website has a direct link to all the press it has received, specifically noting the infamous GQ article, “What It’s Like to Eat Nothing but This Magical, Healthy Ice Cream for 10 days,” that was published in January 20162. It is after that article, that some say the low-calorie ice cream trend gained traction3. 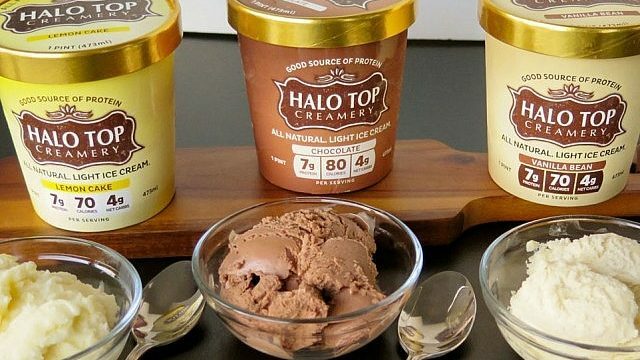 However, it is important to note that even though Halo Top recently became a household name, it is not a brand-new product and was actually founded in 2011 by Justin Wolverton, a lawyer turned entrepreneur, who started making ice cream in his kitchen after he was diagnosed as hypoglycemic and forced to follow a strict diet. In June 2012, Halo Top launched four flavors: Vanilla Bean, Chocolate, Strawberry and Lemon Cake. Those pints of ice cream would be unrecognizable as the company underwent rebranding in June of 2015, changing the packaging to better display the low-calorie and high protein message to consumers. Now it is becoming one of the top selling ice cream brands in the United States and others are starting to notice4. Artic Zero’s line of frozen desserts, founded in 2010, was inspired by a desire to provide a product that satisfies the sweet tooth without compromising a healthy lifestyle, similar to that of Halo Top5. The trend gained traction and Artic Zero underwent rebranding in 2015 as well and packaging to emphasize its place in the market: guilt-free indulgence…sound familiar to another healthy ice cream brand? Kroger released their product this year (Simple Truth), rivaling Artic Zero and Halo Top, in six different flavors: lemon cake, birthday cake, chocolate, vanilla bean, sea salt caramel, and mint chocolate chip6. Breyer’s followed suit soon after, releasing vanilla bean, mint chip, cookies and cream and creamy chocolate. With the resurgence of Halo Top after its rebranding, people are starting to pay attention and it is clear the market is becoming more saturated. People are talking. Consumers began conducting their own at-home taste tests to evaluate the product differences between each brand. You might start to wonder though, what really is it that sets them apart from each other as well as your normal full-fat ice cream. How do they pull it off? Welp, my friends, it is time to delve into some basic food science. As a food scientist, this product category simply fascinates me. The science of ice cream is more complex than meets the eye because it utilizes very basic ingredients (water and fat) that do not like to mix naturally. In order to achieve its characteristic creamy texture, ice cream has to be mixed in a way that results in a fragile emulsion between the water that comes from the milk and fat that comes from the cream while also incorporating air into the mix to provide the fluffy texture. When you reduce the fat content to provide a healthier, low-fat, or even non-fat option, the matrix of the ice cream changes and that creamy texture you crave is out the window. In order to trap air in the matrix without the fat, additional ingredients, categorized as stabilizers, are added to aid in the texture formation. Some common examples are xantham gum (used in Artic Zero), guar gum and locust bean gum also known as carob gum (found in Breyer’s Delights, Halo Top, and Simple Truth). Gums are commonly found on numerous ingredient labels but to be frank, they scare many consumers by coming off as foreign, chemical substances. Gums actually originate from natural sources: guar from guar beans, carob bean gum from carob tree, xanthan gum is a product from glucose fermentation. In the case of low-calorie ice creams, gums act as stabilizers and are critical in preventing large ice crystal formation, acting like emulsifiers and preserving the water/fat matrix, as well as preventing air from escaping the product and conserving the texture we desire7. Similar to the importance of fat in ice cream, sugar plays a major role in providing the desired taste that you crave on a hot summer’s day. Literature shows that you don’t perceive as much sweetness at colder temperatures and therefore normal ice creams contain a high sugar content in order to achieve the desired sweetness8. Since more sugar also means more calories, many of these healthy-hybrids use erythritol which is a natural sugar alcohol, a product of glucose fermentation. Erythritol has 1/20th the calories of regular sugar (sucrose) hence why these ice creams are able to have such a low-calorie count per serving. Erythritol does have a cooling sensation, similar to that if you were chewing mint gum. However, some claim that in ice cream it’s next to unnoticeable, since ice cream is already served at a cool temperature. But, next time you dive your spoon into a pint of Breyer’s Delights, and take a big bite, see if you can notice a cooling sensation after you swallow. Hopefully, this section helped to educate you on the complex challenge of achieving the desired texture in ice cream as well as shed light on some of the more unfamiliar ingredients found on the nutrition labels of these popular low-calorie ice creams. However, this is only the cherry on top when it comes to understanding the ingredients used in these products. What really is the defining factor that draws people to these healthier hybrids over traditional ice cream? One thing that stands out to me is that each pint, regardless of the brand, prominently displays their calorie count per pint on the front of the package. 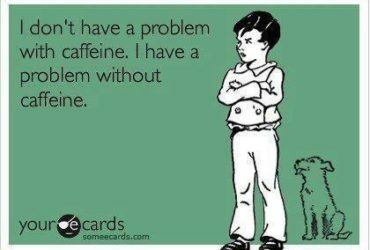 It most cases it is more prominent than the actual flavor! Which makes me think are people eating it more for the low-calorie, guilt-free indulgence or are they eating it for the taste and the yummy flavors? The branding would suggest the former. We all want to live a healthier life, yet sometimes that sweet tooth is too strong to ignore so these healthy hybrids provide a solid compromise. In one quick scan of the dessert display case you will be bombarded with calorie counts and various claims: all natural, GMO-free, gluten-free, no artificial colors, the list is endless! Those claims can have an effect and for most people will fulfil their expectation of what it means to be healthy which will drive their purchase decision. They serve as triggers to set up an expectation. If the experience matches what you expect then you will remember that when you find yourself mindlessly wandering again in front of the ice cream display. 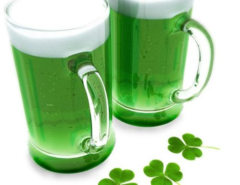 As we move forward I will not be surprised to see this niche explode ten-fold as more flavors are created, different brands move into the product category and the industry gains traction as more people are tasting the products. What is fascinating is have you ever seen a commercial on TV for Halo Top or Artic Zero? Some of you might have never heard of it before. Most of the marketing is done through word-of-mouth, the companies believing that the taste of their product will speak for itself. They were right because here we are talking about it (: So, next time you’re at a grocery store and find yourself in front of the freezer section, take a gander over the ice cream display, maybe grabbing yourself a pint from each low-calorie brand to conduct your own sensory evaluation and determine the true winner. Koppelman, Charles. “How Noosa and Halo Top Are Disrupting The American Dairy…In Record Time” Forbes.com, 15 August 2017. Web. Bartoshuk LM, Rennert K, Rodin J, Stevens JC. (1982). Effects of temperature on the perceived sweetness of sucrose. Physiol Behav. 28(5):905-910.